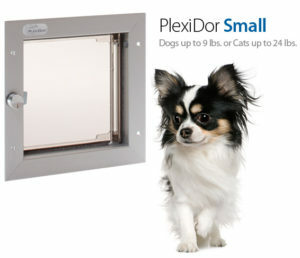 The PlexiDor cat door is intended for cats up to 24 lbs and dogs up to 9 lbs. 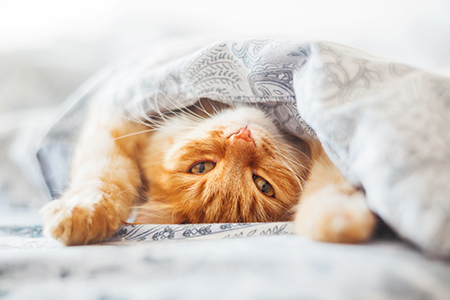 The weight limit for cats is so much higher because they’re built differently than dogs and move differently than dogs. A 24 lbs dog needs much more space than a 24 lbs cat. If you have a dog over 9 lbs, check if they can pass through an opening that is 6 1/2 x 7 1/4 inches through cutting a hole that size in a piece of cardboard and enticing the dog to go through. If it doesn’t seem comfortable with the space, go up to a medium size PlexiDor. The door is available for installation through a house door or a wall, or can be installed with a glass kit. The sturdy aluminum frame is available in white, bronze, or brushed aluminum. not go out again. Or, allow them to go out but not come back in.